We’ve always acted more like a tech company than a food one. Like many tech companies, we want to disrupt. Like many tech companies, we raised venture capital (from the same people who invest in actual tech companies). And now, like all tech companies, we have an in-house tech team. And we just released a sleek new app (more on that in a minute). When we started sweetgreen, we believed it was possible to create a restaurant company that served food that is delicious, healthy, affordable and fast. While we believe we have delivered on the first three, if you walk into a sweetgreen during lunchtime, you might see a line that you simply don’t have time to stand in. Bridging the gap between health and convenience means figuring out a more efficient way to serve healthy, delicious food, because we all have better things to do than stand in line. We spent the first 7 years making the line move faster: one-to-one service (as opposed to an assembly line), better training, better equipment. And we had a lot of success. Most of our restaurants can get customers from the door to their first bite in under 10 minutes. But that isn’t enough. The current system is not perfect, as your tweets and emails have pointed out. But we’ve made massive strides to get closer to it, inspired both by your feedback and our inherent desire to be the best. And today’s app launch is the next step. But this isn’t just a new app — it’s a culmination of a lot of hard work, and it sets a digital foundation on which we can further innovate. Which, going back to the original point, is why we have a tech team. Optimizing our technology and building an in-house team means we can create solutions to more seamlessly fit into our customers’ lives. Over the last year, as Gin Lane translated the desktop experience to a mobile one, we invested in building an internal team, knowing our future success hinges on us being nimble and having tech capabilities in-house. Today, we have a VP of technology, a director of application development, a backend developer, a frontend developer, a product marketer and two IT specialists, not to mention a team of awesome creatives to make everything look as beautiful on a screen as it does in real life. Our internal team tackled the ordering system holistically, diving deep into every step. They retooled our chit system to print order tickets in a more intuitive way that increases accuracy. They collaborated with the operations team to build a throttle algorithm that optimizes our 15-minute order segments, so we can get as close as possible to serving real-time demand. They integrated our new POS system, our menu management system and our backend payment processor so you can pay with your phone and earn rewards. And to make it as frictionless as possible, all online orders are now prepaid, so the pickup experience is seamless — grab and go. Technology can be a scary thing, especially for a retail brand that prides itself on human connections. 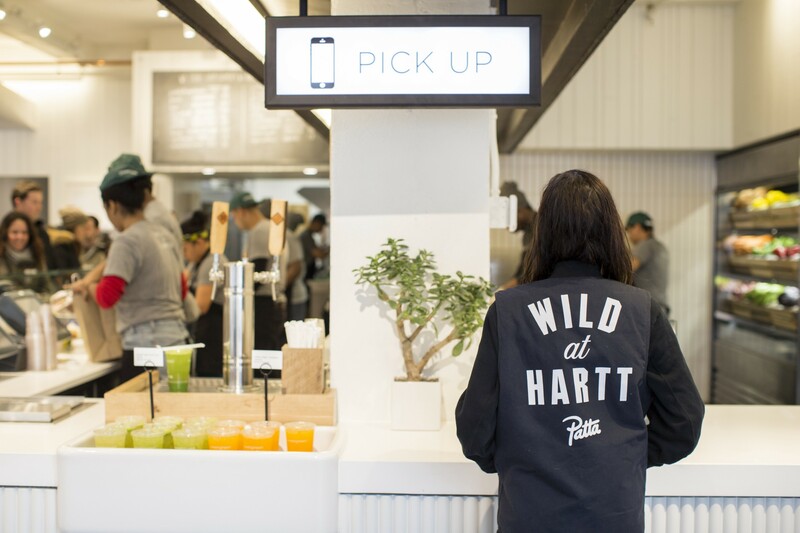 We’ve always been enthusiastic about innovation, but we’ve been cautious about introducing technology might undermine the in-store sweetgreen experience that’s so core to our brand: the music, the art, the food, the people-watching, the team. But then we realized that that’s what bad technology does. Good technology enhances those human interactions and experiences. When we were envisioning our ideal app experience, we talked a lot about how the best technology made life more efficient so you could spend your time actually connecting. We talked about the apps we love, and Uber was at the top of the list — not because requesting a car is an amazing experience, but because arriving at your destination is so frictionless. We wanted to make the experience of picking up your sweetgreen that easy and fast, so you can get on with your day. But we’re also design-forward, so in addition to being functional, it needs to be beautiful, and mirror the sweetgreen in-store experience. We didn’t want the app to feel transactional, and we spent a year to do it right. 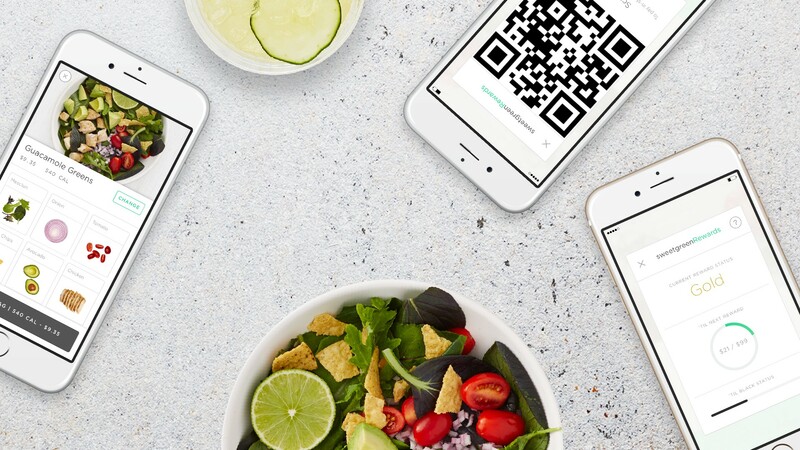 In the app, you can build custom salads, modify in real time (with dynamic nutrition information), flag dietary restrictions, save favorite salads, share your custom creations with friends, reorder your go-to in 5 taps and consume content about our seasonal menu and our community initiatives. It makes it easier than ever to get your sweetgreen fix, and it gives you no excuse to default to unhealthy options simply because you’re strapped for time. The app helps us bridge the gap between health and convenience, the new back-of-house setup makes online ordering more efficient and accurate, and the internal IT investment will propel further innovation. We call that a win-win-win. And a tech team makes it all possible. This app is just the beginning, and we’ve got plans to build upon it and make it even better. Now we just need to figure out how to mix the online order salads. In the meantime, tap that app.